This is my dog. Was my dog. He’s gone now. Went a long time ago. 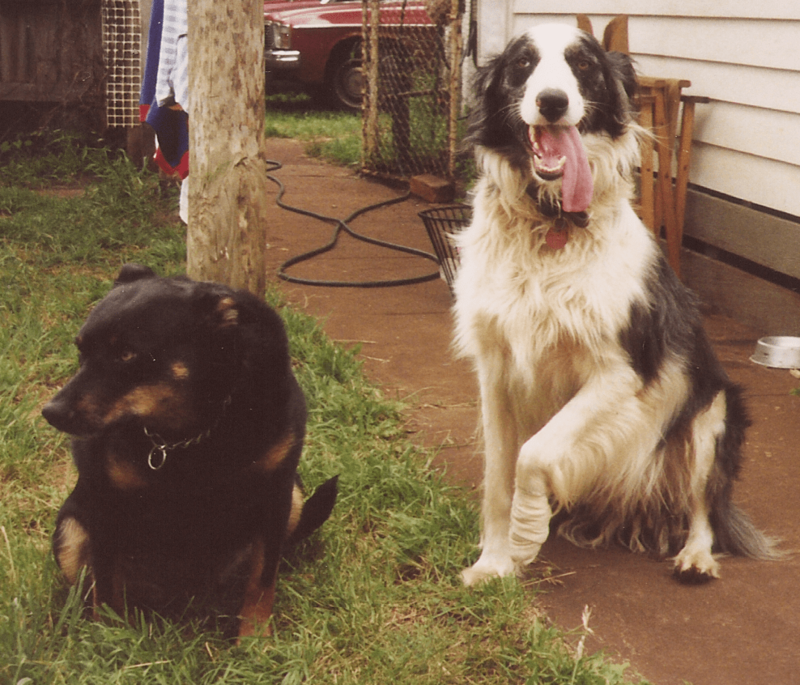 He was a Koolie, an Australian working dog. He was also a little thick. Still a wonderful dog that was devoted and happy as dogs tend to be. We called him Waddley Archa. Waddley for short. It’s a name I picked up from a song that I learned in the USA in 1984. I was working at an American summer camp with the Scouts for 6 weeks. Every week we’d have a campfire as the grand finale of the week with that group of boys. We’d sing lots of songs, I’d lead them in Waltzing Matilda. It was a fun time. I learned several new songs, as you do when you travel around. I brought them back to Australia and taught my own Cub Scouts these new songs, Waddle-ee-ah-cha was one of them. It was really just a nonsense song, no purpose to it, and it had a nice little tune, good to sing around a camp fire. It may have had some actions, and I’ve been sitting here singing it and going through the actions, they don’t seem right, and I look a right dill waving my arms around poking my nose and kicking my feet up. All you gotta do is doodle-ee-do it. So, nice story. But wait, there’s more! I was playing around on the net and found myself at archive.org, The Internet Archive. It’s a non-profit library of millions of free books, movies, software, music, websites, and more. I saw that they had a bunch of music recorded from old 78rpm records. I’ve got a few old 78’s in the cupboard, and an old gramophone to play them on. So I began searching through the treasure of old music to see if there were any recordings that I knew. And there was. In amongst them was one called Doodle-Le-Do by Harry Raby and the 3-D Valley Boys. It’s not dated. I almost went right on past it, then the words began to sing in my mind and I thought, no, it couldn’t be. I hit play and there it was! The song actually has music to it! So, here’s to Waddley and Darcy, our two dogs. Hit play and feel free to sing along. That’s fabulous!!! But you made me cry!!! There’s an old expression along the lines of little things can bring so much pleasure. What a great little story – thanks. I just went searching for this song because it’s from my past. I learned this song at a boy scout summer camp I went to from 1979 to 1983 near Waterbury, Connecticut!